Lama Gönpo Tseten Rinpoche, photo taken circa 1979-1980 in the U.S.A.
Gönpo Tseten Rinpoche (Tib. མགོན་པོ་ཚེ་བརྟན་,Wyl. mgon po tshe brtan) (1906–1991) of Labrang, Amdo — a contemporary Dzogchen master, author, painter, sculptor, and teacher of the Nyingma school of Tibetan Buddhism. Gönpo Tseten was born in 1906 in Amdo, an eastern province of Tibet, into a family heritage of ngakpas. At the age of seven he was sent to Sangchen Mingye Ling, a Nyingmapa monastery. At the age of 15, having shown great promise as a future teacher, he studied with Kargi Tertön and accomplished the preliminary practices of Tibetan Buddhism. At Sangchen Mingye Ling, Gönpo Tseten continued his Dharma studies and the traditional Tibetan arts and sciences. It was at this time that he began to display great skill in drawing, painting, and sculpture. In 1925, at the age of 18, he completed two images of Thousand-Armed Avalokiteshvara, each standing over six feet high. About the age of twenty he married and had a son, Pema Rigdzin. He then undertook a journey of twenty days in order to study for a year with the Tertön Choling Tuching Dorje, a disciple of Dodrupchen Rinpoche. After this, he studied with the great Dzogchen master Khenchen Thubten Chöpel, who was also a guru of Dilgo Khyentse Rinpoche, Khenpo Jikmé Phuntsok, and the Sixth Dzogchen Rinpoche. During that time he received the complete transmission of the Rinchen Terdzö—he later received it twice more from Dilgo Khyentse around 1950 and 1978. Later, the ngakpa Gönpo Tsering taught him Tu, the art of overcoming enemies. This was essential since his gompa in Amdo needed protection from surrounding afflictions, including ruthless bandits and wild animals. After this, he studied sutra and tantra, including the Yönten Dzö, at Sukchen Tago Gompa in Golok, which was established by the First Dodrupchen Rinpoche in 1799. His student Ngawang Khedup, who studied with Lama Gönpo in Clement Town, Dhera Dun, India, and accompanied him when he came to America, reported that among the other places Gönpo Tseten studied in his youth was one of the most famous of Tibet’s tantric colleges (Rekong Ngakmang, 'the place of many tantrikas') in Amdo, where the most secret yogic practices were taught in depth and practised to completion. At the end of the tummo course, as a test of their accomplishment, students would go on a cold winter's night into deep pits dug in the ground behind the buildings. They would go down to the bottom of one of the shafts and see how many wet blankets could be dried out in a single night by inner heat. The exuberant students would also see how far that they could ascend into the air above the hole, to discover which among them could rise up the highest. "I was told," Ngawang wrote, "that people standing at a distance away could see Lama Gönpo rising above, not just the other yogis, but also the row of buildings that were in front!" Having himself brought tantric siddhis to fruition, Lama Gönpo understood and strongly emphasized to his students that such outward signs must be the fruit of inner realization rather than goals in themselves. In 1932 he met his root guru, the Longchen Nyingtik lineage holder Patrul Rinpoche Kunzang Shenpen Özer of Tsö, the tulku of Patrul Rinpoche Chökyi Wangpo. Tsö Patrul Kunzang Shenpen was himself a heart-son of Adzom Drukpa Drodul Pawo Dorje, the lineage-holder of both Jamyang Khyentse Wangpo and the first Patrul Rinpoche. According to the late Dilgo Khyentse Rinpoche, in his autobiography Brilliant Moon, Patrul Rinpoche of Tsö was an emanation of Avalokiteshvara and a very unusual person who would feed hundreds of beggars at his monastery upon condition that they enter the gate of the Dharma and undertake ngöndro preliminary practices. Under his guru's guidance he did Richö, a solitary mountain retreat, for four years including ngöndro, tsa-lung and Dzogchen, progressing through the stages of the path to the realization of the supreme state. At the end of his retreat, Patrul Rinpoche of Tsö asked him to teach others and, in 1936, he was given the role of Dorje Lopön, or Vajra master, which has the authority to transmit the Vajrayana and its practices, and lead those practices in the Sangha. As well, he was given the knowledge-holder name Rigdzin (Vidyadhara) Trinlé Özer. For two years he taught tsa-lung and Dzogchen at Patrul Rinpoche's monastery in Tsö. He then did further retreat for one year to deepen his realization before going to Dzogchen Monastery in 1939 and 1940. Lama Gönpo then returned to his own gompa, Sangchen Mingye Ling, bringing with him with him the Kangyur, Rigdzin Jikmé Lingpa's Sung Bum, Yönten Dzö, and other major texts totaling 1,552 pages. At Sangchen Mingye Ling he was awarded the title Khenpo by the 5th Jamyang Shepa of Tashi Kyil, Lozang Jamyang Yeshe Tanpa (1916-47), the principal Gelukpa monastery at Labrang, which had a long-standing close relationship with the Ngagpa community at Rekong. Jamyang Shepa also enthroned him as Abbot of the Nyingmapa College of Tashi Kyil. He also did another several years of retreat. Converting his monastery to one which concentrated on the Longchen Nyingtik teachings of Rigdzin Jikmé Lingpa, he would teach the Kunzang Lamé Shyalung of Patrul Chökyi Wangpo. In the winter he taught tsa-lung, and in the summer, Yeshe Lama. His fame spread far and wide like the rays of the sun. Gönpo Tseten Rinpoche with Dilgo Khyentse Rinpoche at Rekong Gompa, circa 1950. 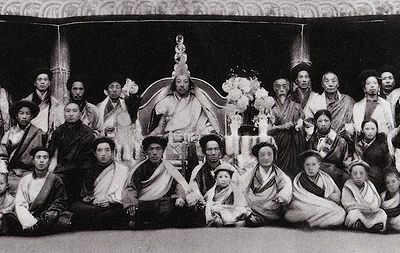 Gönpo Tseten Rinpoche is standing 2nd on the right in the above photo, directly in front of the pillar. Numerous lamas asked him to teach at their gompas. He taught at eight monasteries throughout Amdo, teaching twice a year at each. As well as time spent teaching, Lama Gönpo did extended retreats and received many transmissions from other masters, among which around 1950 was the Rinchen Terdzö, from Dilgo Khyentse Rinpoche at Rekong Gompa, at Shohong Lhaka (regarded as the actual palace of Chakrasamvara), in Amdo. Dilgo Khyentse had made the journey to Amdo with his family in order to give the Rinchen Terdzö at the request of his own guru Jamyang Khyentse Chökyi Lodrö to a gathering of 1900 ngakpas. Rekong was the birthplace of both Lama Gönpo's root guru Tsö Patrul Rinpoche and of the supremely accomplished Shabkar Tsokdruk Rangdrol; the two great masters both trained at the gompa there. The photograph on the right of this page, taken at Rekong Gompa in 1950, shows Dilgo Khyentse Rinpoche and Lama Gönpo. The latter has the typical long matted locks of a ngakpa wound around his head. From 1957 to 1959 Lama Gönpo taught at the renowned Tsering Jong Monastery of Kunkhyen Jigme Lingpa himself near Lhasa. In 1959, Lama Gönpo managed to escape from Tibet. Having arrived in India, Lama Gönpo steadfastly continued to teach the Dharma far and wide, and received numerous teachings from other exiled teachers. There, he wrote a compact edition of the Kunzang Lamé Shyalung. To dispel obstacles, he did a three month retreat on Vajrakilaya at the residence of H.H. the Dalai Lama. At the end of his retreat the Dalai Lama presented him with an offering of a phurba, a national treasure passed down from the great terton Nyang Ral Nyima Özer (1124–1192), the first of the five sovereign terma revealers. Much later, since no material object was important to him in the least unless it could serve the Dharma, due to his foreknowledge at the appropriate time before he departed for the Copper-Coloured Mountain in 1991, Lama Gönpo transferred this precious artifact to a generous benefactor and gave all of the large donations he received to help fund the community of nuns he was guiding in Amdo. From 1967 to 1978, Lama Gönpo taught at the Nyingmapa Lamas College at Clement Town, Dehra Dun, India, teaching the entire range of the preliminary and advanced practices. Tashi Tsering, who is at present (2009) studying for his PhD at the University of British Columbia, wrote of Lama Gönpo's life at that time: "He lived next to our house in Mussoorie [near Clement Town], India, in the early to mid 1970's. My mother once said that Agu [uncle] Gönpo Tseten can levitate up to a meter cross-legged because of his yogic and spiritual accomplishments. I was about 5 years old; I used to sit next to him as he painted thangkas. I remember one time he painted my little sister's nails, and mine too. Although I met him only a few times when I was about 5, I remember vividly that he radiated what I now realize was loving kindness." 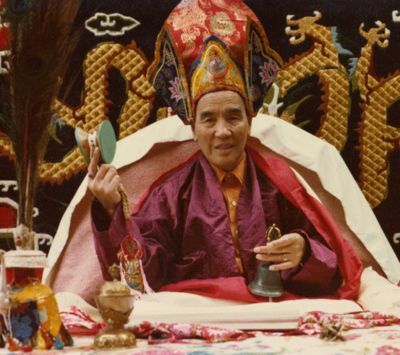 In 1978, Lama Gönpo was requested to come and teach in the United States by Gyatrul Rinpoche. Ngawang Khedup related that as plans were being made for the Lama's journey to teach in the USA, "...when the word got out some young lamas from the big monastery turned up at his house in Clement Town and requested with a mandala offering to give teachings to them before he left and to pass on his special lineage and techniques. This amused Lama Gönpo to no end and he told them in his colloquial Tibetan that I understood well enough that, 'In all the years I have been here no one has come around asking for these teachings and now that you have learned that I am teaching westerners and going to California, all of a sudden you come asking for my transmission; best you go back to your big monastery and get the teachings from your big Lama there.'" Before his departure for America, together with a vast body of practitioners Lama Gönpo again received the Rinchen Terdzö from Dilgo Khyentse Rinpoche, this time at Mindroling Monastery in Dhera Dun. During the regular breaks in the empowerments themselves Gönpo Tseten Rinpoche gave oral commentary and teachings on the transmitted texts and practices to the assembled multitudes at Dilgo Khyentse's request. From 1979 to early 1982, accompanied by his consort Pema Lhanzam, he taught mainly in California. He taught almost the entire Longchen Nyingtik cycle, including the Yeshe Lama to his devoted students. He was particularly skillful in his guidance of disciples, and could be very gentle, paternal, warm, and encouraging or forthrightly challenging, always expecting those who studied with him to make the greatest possible effort in their practice. Lama Gonpo continually stressed the importance of careful practice. He would point out that he himself had completed the ngöndro preliminary practices three times. The first time was when he was about thirteen or fourteen, and he said that he went through the recitation quickly and afterward didn't feel that it was very firm. The second time, thinking he hadn't done the ngöndro so well, he did it again with great care. Then, the young Gönpo Tseten felt it had come out quite well. The third time he did the preliminary practices, he performed them with the motivation of liberating all sentient beings burning deep in his heart, "and it came very, very well." While he taught that the main practice of the Dzogpa Chenpo is Trekchö and Tögal, the ngöndro is the foundation. Once, after the appearance of unmistakable signs, Lama Gönpo told a disciple, "You are definitely the incarnation of a yogin of Tibet who did Dorje Phurba practice." When the student asked if it was possible to discover more about this, his teacher casually replied, "Of course, but inquiring into past lives is not important for most people. It takes away attention from the key point. The key point for you is to bring to fulfillment the practice in this very lifetime." A few days thereafter the vidyadhara bestowed the necessary empowerments on the student in order for him to continue the path his teacher had identified. While in America, Lama Gönpo was an inexhaustible river of extensive ripening empowerments and teachings on every level of the Longchen Nyingtik. This included: teachings and prayers upon first awakening in the morning, teachings on the Nine Yanas, Rigdzin Jikme Lingpa's kyérim text Staircase to Akanishtha, extensive Chö transmissions, Phowa, Shitro, Yumka Dechen Gyalmo (the Queen of Great Bliss), Rigdzin Düpa, among many others, as well as teachings on the nature of mind—from both Semdé and Longdé categories, and all the way up to and including the unsurpassed Yeshe Lama—all transmitted from the perspective of highest Dzogchen Atiyoga. The minds of numerous students were ripened and set firmly on the path as a result of his teachings. Two well-known scholars who studied with Lama Gonpo were Anne C. Klein and John Myrdhin Reynolds. When the Chinese government allowed exiled Tibetans to return in 1982 Lama Gönpo, despite the fact that he had attained the age of 76, courageously returned to Amdo, the region of his birth, and gathered a dedicated community of practitioners including monks, ngakpas, nuns and lay people (both Tibetan and Chinese) to help in the revival of the Dharma in the Land of Snows. He returned to America in 1983 and again in 1984, and several of his devoted Western disciples made the journey to Amdo. In some cases his Western students were able to return to be with their guru many times, staying for as long as possible to be near him. 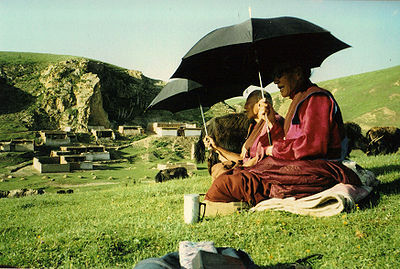 In 1984 Lama Gönpo spent time with H.H. Dilgo Khyentse Rinpoche in France before returning to Tibet for the final time. They remained in close communication after Lama Gonpo's return to Tibet until his passing at the age of 85 in 1991. According to Tulku Thondup, Tulku Urgyen Rinpoche, Gönpo Tseten Rinpoche and Trulshik Rinpoche were H.H. Dilgo Khyentse's most senior disciples. Before Lama Gönpo left the USA the first time, at a final interview with one of his students, who was himself embarking on the path of a spiritual teacher, the disciple requested his root guru, "This is the last time we will meet in this life. What are your essential instructions for me?" The great vidyadhara answered simply, "Always teach pure Dharma, and always rest in rigpa." In these two phrases Lama Gönpo Tseten set forth a succinct and accurate description of his own life and teaching. Lama Gönpo Tseten was deeply humble and comfortable in all situations, both high and low, and was immune to praise or blame. Unlike many people who are called spiritual teachers, he never found enjoyment in sitting on high thrones or receiving the veneration of his students. Lama Gönpo kept to the style of a hidden yogi. He had no interest in wearing brocade robes, and had a minimum of material possessions. His consort often mended the ones he had, since he preferred to dress simply and did not care in the slightest about impressing others. As a guru Lama Gönpo's approach was always matter-of-fact, and his teachings in both public and private were such that his hearers felt that he was speaking as one person to another, never as a king to a lowly subject. One always had the impression that he cared about you deeply, and that his words and actions were the outward activity of great inward compassion deriving from his own lived experience. Like the ancient Mahasiddhas, Gönpo Tseten Rinpoche had no interest in having large numbers of students, founding organizations, or building dharma centers and so left that activity for other masters to accomplish. Although he himself possessed unimpeded insight and had the power to authoritatively recognize and enthrone tulkus, which he occasionally did as he foresaw would be helpful, Lama Gönpo did not consider his own enthronement as a reincarnate master to be necessary and so dispensed with that formality. Into the lotus-like Wisdom Mansion of your heart. Glorious teacher Vidyadhara Trinley Ozer, may you live long. The Supreme Dharma's excellent activity spread widely like pollen. Fly in the Dharmakaya's sky. Lama Gönpo had planned to depart this world on the tenth day of the sixth Tibetan month, which is the anniversary of the miraculous birth of Padmasambhava, Guru Tsokyé Dorje, the Lake-Born Vajra. However, he kindly acceded to his students' request and delayed his departure three days. Like Kunzang Sherab the 1st Throneholder of Palyul, and Terdak Lingpa the founder of Mindroling, just before his parinirvana the vidyadhara Trinlé Özer, as he had predicted, saw the dakinis coming to convey his consciousness to the Copper-Coloured Mountain, Guru Rinpoche's pure land. Lama Gönpo made beautiful inviting mudras as his physical body was dying, and passed into the sphere of ultimate truth on the 13th day of the sixth Tibetan month in the (female) Iron-Sheep Year of the 17th Rabjung, 1991. Subsequently, further signs of Gönpo Tseten Rinpoche's attainment of the uncommon siddhi continued to manifest. Even though obstacles arising in the minds of the local authorities prevented Lama Gönpo's disciples from cremating the precious Kudung of the master according to the traditional method, still, a great number of pearl-like ringsel, one of the five types of sacred relics, were present in the ashes. As well, an image of Milarepa was visible in a bone fragment. These have been preserved to this day in both Tibet and America. Like his root guru Tsö Patrul Rinpoche, Lama Gönpo did not consider that the public recognition of a tulku in infancy was invariably preferable, but rather giving the rebirth of a realized master the opportunity to mature and practice without publicity and its attendant distractions could be beneficial in the long run. He mentioned in 1981 that he would not reincarnate as a conventional tulku, but would send emanations directly from Zangdokpalri. A Bouquet of Uḍumbara Flowers: An Explanation of the Tenth Day (tshes bcu'i rnam bshad u dum wa ra'i chun po, 1981). A Brief Account of the Throneholders of Both New and Old Tantric Schools of the Land of Snow: The Wondrous Lotus Garden. Among Lama Gönpo Tseten's many artistic accomplishments are two major murals in Clement Town, Dhera Dun, India: “Amitabha in Dewachen” at Tashi Gommo Gelugpa Monastery, and “Mount Meru and the Universe System” at the Nyingmapa Lamas College. He also painted a large thangka of the Longchen Nyingtik Refuge Tree and smaller thangkas of Padmasambhava and Vajrakilaya, some of which he gave to Thinley Norbu Rinpoche. Subsequently, the main figure of Guru Rinpoche of Lama Gönpo's painting of Padmasambhava, Longchen Rabjam, and Jikme Lingpa, which can be seen below, was used as the cover for The Padmakara Translation Group's translation of White Lotus by the 1st Jamgon Mipham Rinpoche. Prayer to Gonpo Tseten Rinpoche/Rigdzin Trinley Ozer to be used during and after his life. It composed by him at the request of one of his nuns circa 1983/4 in Tibet. The Phurba used by Nyang Ral Nyima Özer which was offered to Lama Gönpo Tseten Rinpoche by H.H. the Fourteenth Dalai Lama. Longchen Nyingtik Lineage Tree by Gonpo Tseten Rinpoche, with depictions of the gurus of his lineage, painted prior to 1980. Schema of the Longchen Nyingtik Lineage Tree thangka by Gonpo Tseten Rinpoche, with names of the gurus of his lineage. Painted prior to 1980. Guru Rinpoche painting by Lama Gönpo Tseten Rinpoche, prior to 1981. Vajrakilaya painting by Lama Gönpo Tseten Rinpoche, prior to 1981. Lama Gonpo Tseten Rinpoche with Yeshe Lama retreatants at the practice center of Tsö Patrul Rinpoche, Amdo, Tibet. Alak Jinpa on Lama's left, Alak Khandro on Lama's right. Lama Gönpo Tseten's residence at his monastery in Amdo, Tibet, circa 1990. 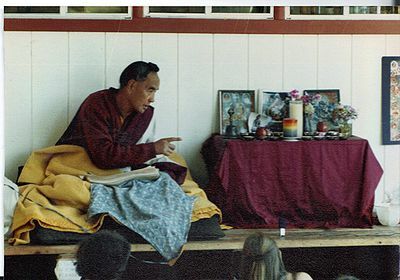 Gonpo Tseten Rinpoche doing practice with ngakpas in his temple, Amdo, circa 1990. ↑ An extraordinary siddha, he is referred to as Lama Ngakchang (རིག་སྔགས་འཆང་) Gönpo Tseten Rinpoche in Dudjom Rinpoche's biography Light of Fearless Indestructible Wisdom, Snow Lion Publications, Ithaca, NY, 2008, page 143, by Khenpo Tsewang Dongyal. ↑ However, after two years he and his wife separated. He later married again, this time to Drolma Chi with whom he happily spent the remainder of his time in Tibet before 1959. Three years before the Chinese army arrived, he moved to Lhasa with his wife and son. Unfortunately, in the terrible conditions during the Chinese invasion of Tibet, Gönpo Tseten became separated from his wife and son, who did not escape. ↑ This was one of the first and most extensive transmissions of the Chö teachings given in North America, according to the famous Longchen Nyingtik Chö text called Laughter of the Dakinis. ↑ This thangka was given to Thinley Norbu Rinpoche and later used to illustrate the cover of White Lotus, translated by the Padmakara Translation Group, Shambhala 2007. Immortal Protector of Beings: A Brief Biography of Lama Gonpo Tseten, 1992; Lama Gonpo's published Curriculum Vitae, 1979 and 1980; Long Life Prayer of Rigdzin Trinley Ozer (Lama Gonpo Tseten) by Thinley Norbu Rinpoche, 1979; Booklet on the Vajrakilaya Empowerment which includes a biography of Lama Gonpo Tseten, 1980; various remembrances by Tashi Tsering, Phurba Trinley, Rinchen Khandro, Yang Chen, Jangchub Drolma, Ngawang Khedup, and recollections by his long-time translator and heart-disciple Choying Palmo. Other references are taken from The Nyingma School of Tibetan Buddhism, Volume I, 1st Edition, by Jikdral Yeshe Dorje, Dudjom Rinpoche, Wisdom Publications, Boston, Massachusetts; 1991, Masters of Meditation and Miracles: The Longchen Nyingtig Lineage of Tibetan Buddhism, by Tulku Thondup Rinpoche, Shambhala Publications, 1st ed, Boston, 1996; The Violence of Liberation: Gender and Tibetan Buddhist Revival in Post-Mao China, by Charlene E. Makley, U of California Press, 2007; and from The Spirit of Tibet, a biography of Dilgo Khyentse Rinpoche by Matthieu Ricard, copyright 2000, Aperture Foundation, New York, NY. This page was last edited on 19 October 2018, at 08:25.